I had a great time in Lake Tahoe last week. 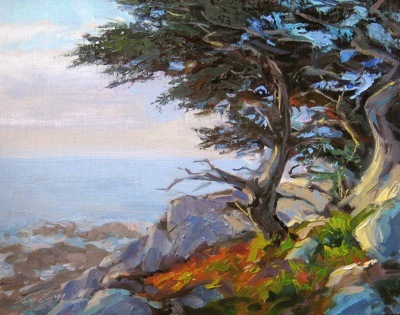 I painted a couple plein air, but they need some adjustment in the studio before I consider finished. This is a studio painting of the north/east shore, on the Nevada side. The friends we stay with their have a speed boat, so we were able to visit lots of little coves accessible by water. This was painted 100% by palette knife. I wished I’d taken interim photos, because I think it would have made a good demo. The painting is basically 4 bands of color, so I started it much like I would a Hensche still life, like this one. That is, large bands of solid color, with white in between. I keep the white there only because I don’t want edges to touch until I’ve worked out the basic color relationships for each block of color. With the four bands of color down, I continued to adjust the color of each band. When I got them right, I brought the edges of the color bands together, then started to model the objects within each band. For example, the rocks started as a medium value rock color. I then added shadow sides of the rocks (first scraping that area a bit to avoid creating muddy color), then mid-tones, light sides, color variation (warm/cool) within each rock and finally darkest darks. The same approach was used for the trees and water. The sky stayed relatively solid, although I did add some flecks of lighter blue/green at the horizon of the sky. 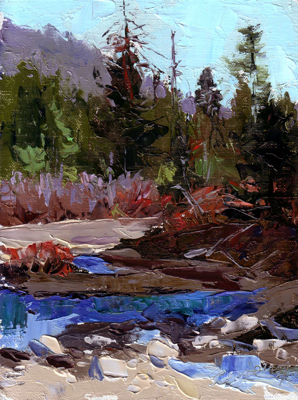 I’m in the North Tahoe Plein Air show next month, and a hotel and restaraunt in the area is interesting in buying some of my Truckee River work, so looks like I’ll be painting Tahoe scenes a few weeks now. 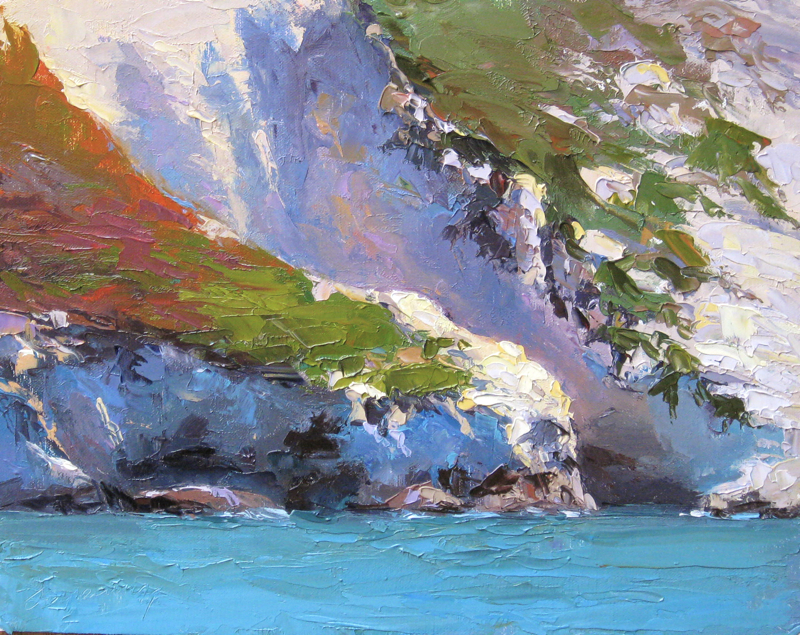 I’m still experimenting with use of the palette knife to apply paint. 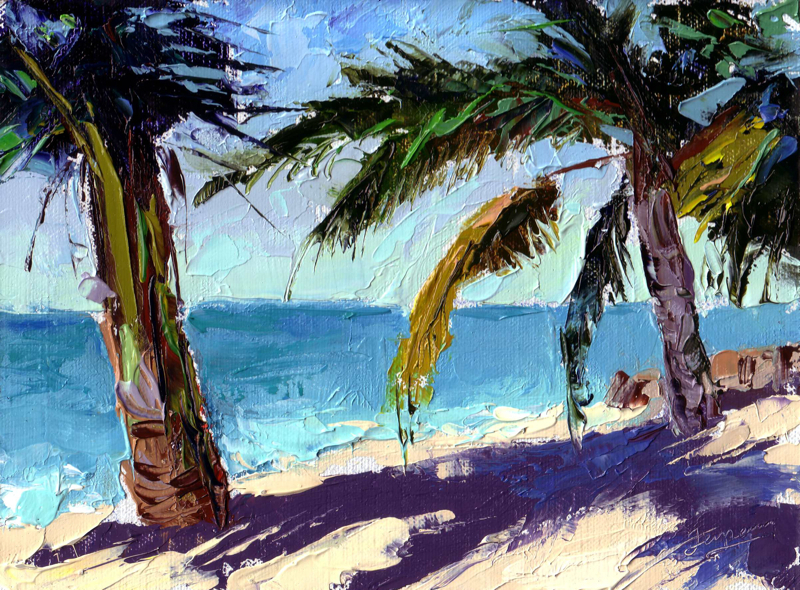 In this most recent study, I combined brushwork with the knife. Most of the paint was applied with brush, and used the knife for areas I felt were best suited for it, like adding texture in the center of interest, and in some cases using it to apply paint on top of wet areas that would otherwise not take well to a brush (and create mud). This was done in studio from a reference photo of Pescadero Point, which is on the 17-Mile Drive in Carmel. It’s a really stunning area (here’s an interesting 360 interactive map). 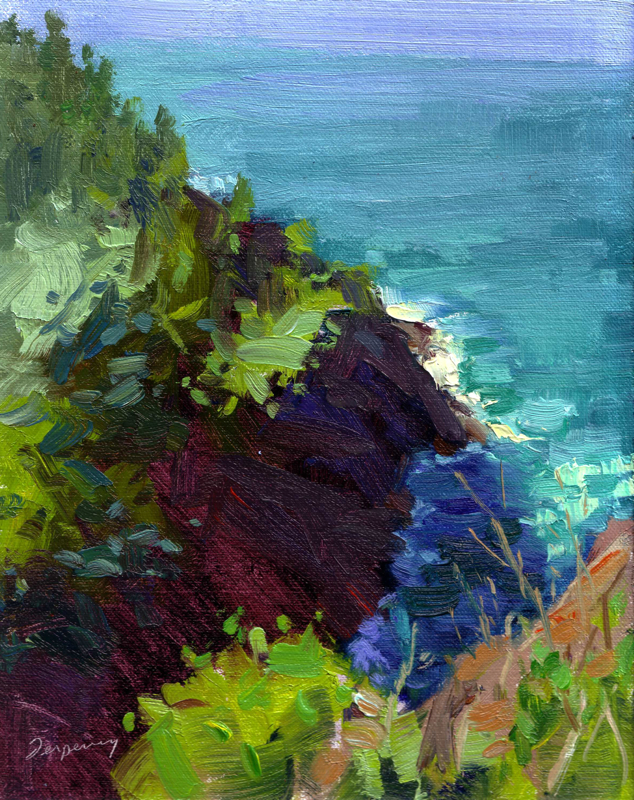 Still painting with a knife, and really enjoying the process (unlike poor Cristy Anspach, who wrote a very funny comment on a previous post about painting with a knife). Laura Reilly and Bill Guffy also chimed in with their comments and positive experiences. This is keeping me loose, keeping colors clean, and just a physical challenge. Imagine holding a paint brush for the first time, learning how to maneuver it. Same with a knife–although, according to John Ebersberger, my knifes are soft enough. Apparently, his are as soft and flexible as a brush. He said I need to file mine down. 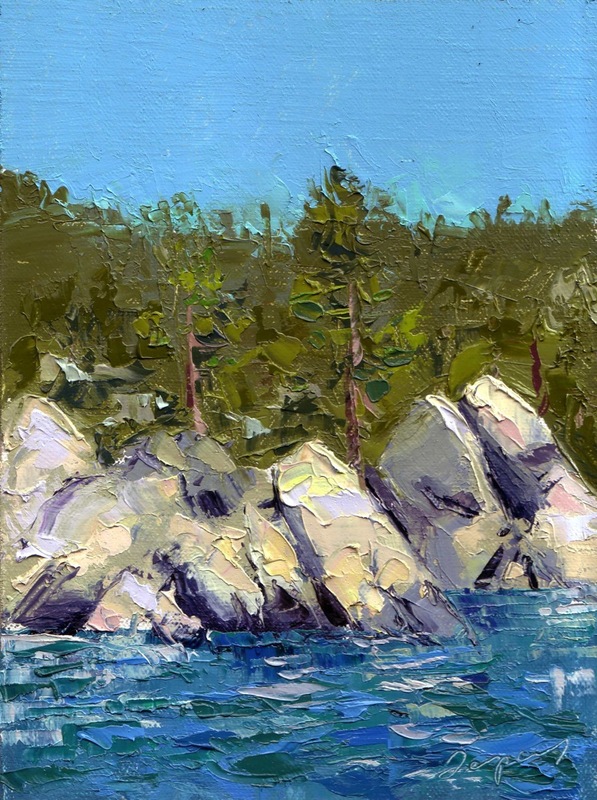 Cosa Cosmos Beach, Oil on Linen, 6x8"
I named this painting “Truckee River”…I think that’s right, although it may be Blackwood Canyon, another favorite spot of mine in Lake Tahoe. I’m really happy with this one, so it could end become a larger studio work, although I’m not sure how large a painting I can do with a knife. Truckee River Warmth, Oil on Linen, 8x6"
If you paint with a knife, and would like to share your work, enter a comment and share with me and my readers. Cheers! Painting with a painting knife last week in John Eberberger’s workshop last week reminded me how different it is from a brush. The main differences are :1) you have less control (at least I do, I’ve seen some deft knife handeling by experts like Camille and John); 2) you can achieve much cleaner color; 3) the texture of the painting is interesting. I have an ongoing goal to loosen up my paint application, so the knife is a great tool. Do you use a painting knife? What’s your experience? 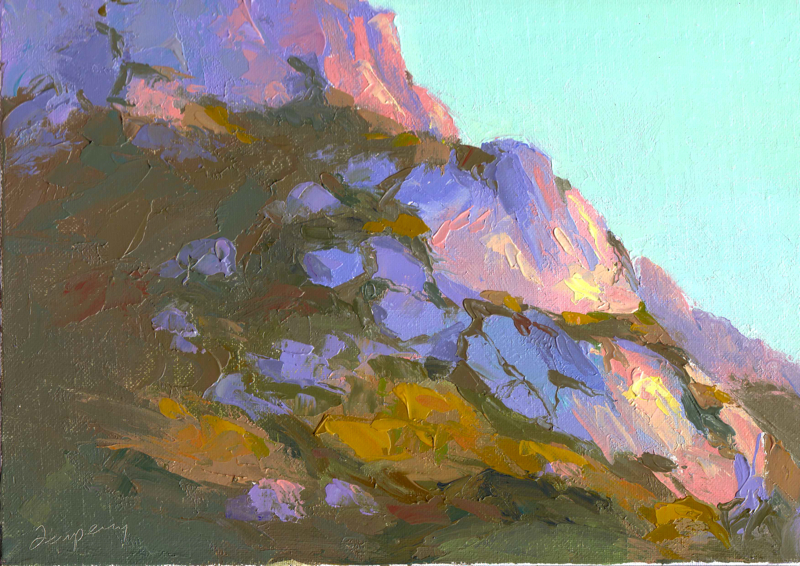 Untitled (Landscape), Oil on Linen, 11x14"
While looking through reference photos last night, I stopped at one that had caught my eye before. In the distance, a rower in a small row boat on the lake. After zooming and cropping, I found an image and design that I liked. I’m starting to second-guess parts of this painting, now that I’ve had a day away from it and see it here online. Although the water on the left had reflected sky and light through the trees, I’m not sure it does the painting any good. There’s not an area for the eye to rest. I may try blocking it back out, or making the color/value shifts too dramatic. Also, that blue in the water is too close to the blues elsewhere in the painting, especially the t-shirt. If I’d kept to greens there, it would probably have given the figure additional emphasis. I can see reading other blogs we do a lot of second-guessing. Not sure I’ll get back to this one, if I do, I’ll post an update. In the meantime, your thoughts are welcome! 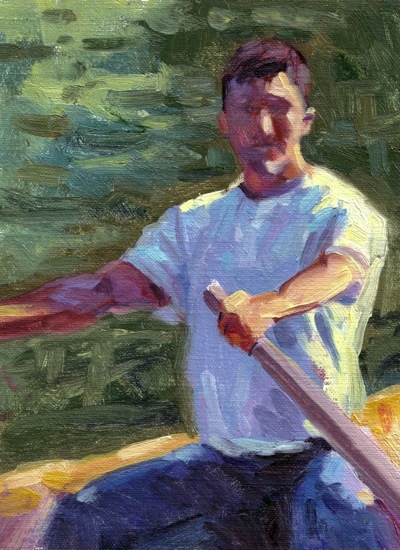 Rower (Stow Lake), Oil on Linen, 8x6"
As (primarily) a landscape painter, travel is important. The Bay Area is beautiful, with lots of variety, but there’s nothing like getting out of your usual surroundings to spark new creativity, inspiration and push yourself technically. 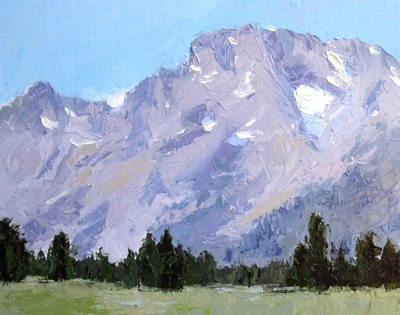 This past Spring I was fortunate to study with Kevin Weckbach (I highly recommend his workshops, here are my notes) at The Scottsdale Artist’s School. The Arizona landscape is a different planet compared to home, so it was fun painting there. The greens and reds especially are much different. I know I don’t have the reds of the soil there down yet. I think it probably has more violet in it that I’ve depicted here. 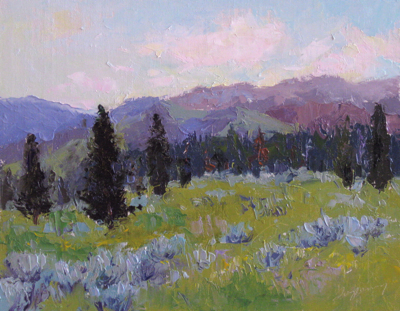 I’ll just need to get back out there and paint plein air to find out! 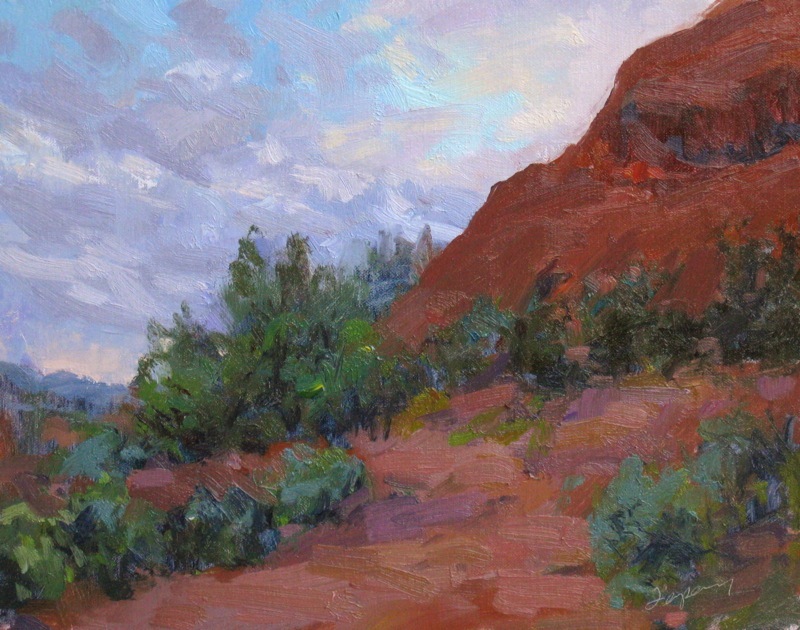 Michael Chesley Johnson teaches in Sedona, Arizona, four months every Winter/Spring. Michael clearly knows this landscape.